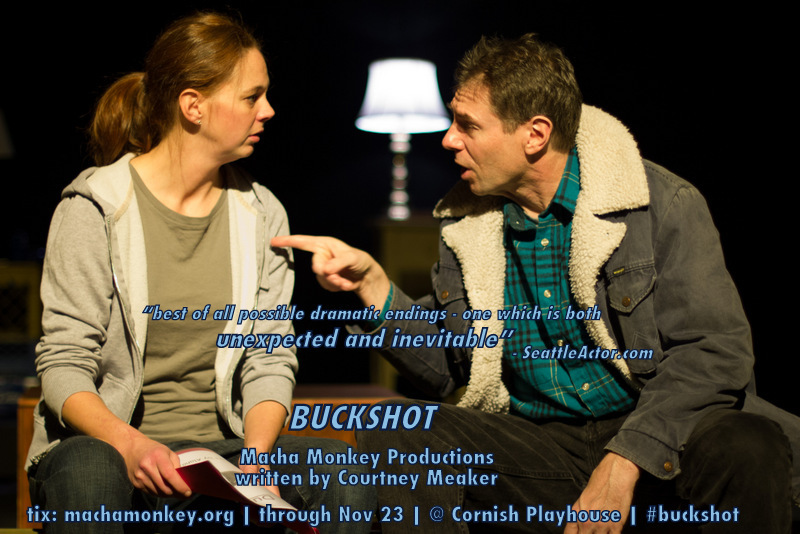 Buckshot premiered on November 8, 2013 in Seattle, produced by Macha Monkey Productions and directed by Peggy Gannon. Alana and Mel are officially moving in together. While packing up in preparation for their new apartment, Alana receives a phone call from her brother, Saul. Saul informs Alana that their long-estranged Uncle Hal has finally surfaced and has Alzheimers. Over the next couple of days as Alana prepares for Saul to visit, she violently quits her job, breaks off her relationship with Mel, and attempts to destroy her friendships with Jax and Jalyn. Buckshot explores the lengths we go to in order to protect our siblings and ourselves from the past and present. At times, surprisingly funny, Buckshot deals with the realities of abuse as well as common ups and downs of being in relationships.